Are you enticed by the idea to smoke cigars instead of regular cigarettes? Then you are on the right path to becoming a connoisseur, and the first thing you should do is to purchase a cigar humidor. This is a unique type of item, intended to keep your cigars at perfect humidity levels, so they don’t dry out. This guide is designed to help you choose from the many humidors available on the market. As someone who may be new to this, the array of choices must feel overwhelming. There seem to be so many things to know about humidors and cigar care in general, and also plenty of people who look like they are much more knowledgeable than you. But that is no reason to feel discouraged. We are here to help you with some reliable information on the best cigar humidors that are currently available, and we will show you what aspects count, and what model you should pick, according to your habits and preferences. When you consider investing in such an essential item for your home, we know that it can feel like a challenging task to do the right thing. Count on our help, as we have already researched the topic for you. You don’t have to break the bank to purchase an excellent humidor. The following advice focuses on providing you with all the information you need to ensure that your cigars will be in top-notch condition whenever you are in the mood for one. At the same time, you don’t have to be discouraged by how complicated choosing a humidor may seem. Just like when you compare cigar ashtrays, first, you will need to examine various options available. When thinking about humidors, your mind may take you to that classy box on some hot shot’s table in a movie, from where the main character extracts a fine cigar to enjoy. If that is the case, you may be a little surprised to learn that humidors are not limited to that particular design. That being said, let’s talk a little about the types of cigar humidors for sale currently available. First, there are room humidors which, as their name indicates, are very large and take up an entire part of a room, if not one entirely. This is the commercial type of humidor that only cigar suppliers truly need since they must have a special set up for such thing, provided the operation they run. Cabinet humidors are less intimidating than room or walk-in humidors, as they are called, yet they are still pretty impressive. You can keep a large number of cigars in such a humidor. They look just like a regular cabinet – maybe fancier – and they serve this particular purpose, which is to keep your cigars in top-notch condition. However, if you are just starting out, buying this kind of humidor would be a bit of a stretch. What you should be more interested in is a personal humidor. 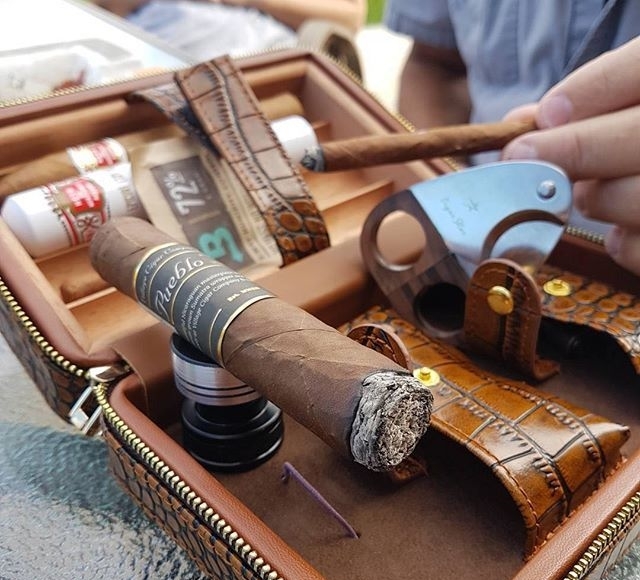 This one can hold enough cigars for you to enjoy without going over the top, and it also looks like the image you have about a cigar humidor as you might have seen in movies. There are also portable humidors that you can take along with you when traveling. If you are fond of smoking cigars, having such a thing with you can help you indulge in your favorite habit even when you are away from home. Seeing that they need to keep your cigars fresh, and that is not exactly an easy thing to do, you may want to learn more about the materials used for humidors. The cigar humidors reviews available may tell you a few things about what counts as the best choice of materials, and this precisely what we are going to talk about right now. Wood board, acrylic glass, and metal are the few choices for humidors that you can pick from. The most sophisticated and also appreciated design is the one made from wood from one end to another. You can choose from quite a few exciting options, as manufacturers use wood such as cherry, oak, pine, mahogany, or cherry, to name a few. Of course, this is usually the case for smaller humidors. The larger ones, like cabinet humidors, can even be made from marble, while others may be covered in leather. That is what you should know about the exterior of a humidor. There is quite a unanimous opinion that Spanish Cedar should be used for the interior, no matter what the exterior is made of. This wood is famous for its ability to withstand humidity without bending and becoming frail. A humidor is, as you may expect, a bit more complicated than just a box for keeping your cigars. A hygrometer is incorporated, for measuring humidity levels. Some also come with a locking mechanism, since cigars are expensive. Some models even have multiple trays. You will also see models that come with dividers, so you can quickly pick a cigar, whenever you want, without disturbing the entire lot. Dividers also serve to set apart different type of cigars. A humidifier is another component present, and its role is to provide enough humidity for the cigars. 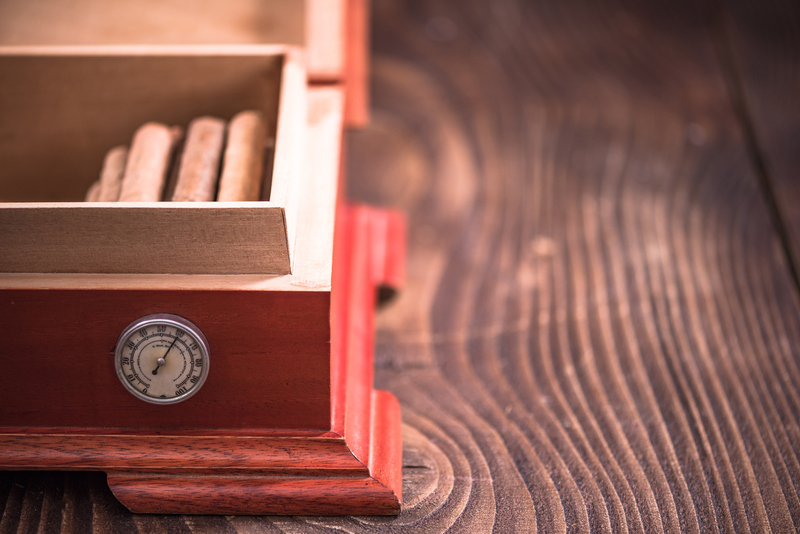 Purchasing a humidor involves quite a bit of commitment on your part. That means that you will always have to keep your humidor in dark and cool spots, where there is no risk of light and temperature to change drastically. Also, you need to make sure that you don’t place other things on top of the humidor. When you bring such a thing home for the first time, a good idea would be to monitor the hygrometer during the early days, to catch quickly any quick changes in humidity levels.